The module can be managed visually and centrally by SCHIDERON intelligent lighting management system (LMS). The data of each channel in the module can be uploaded to the intelligent lighting management system for module data management and status analysis. Scene management is to pre-set the time for the module through the LMS, and then open the corresponding scene mode, to open all or part of the module loop. 1 channel input, 4 channel output. The control of each channel loop can be configured via software. 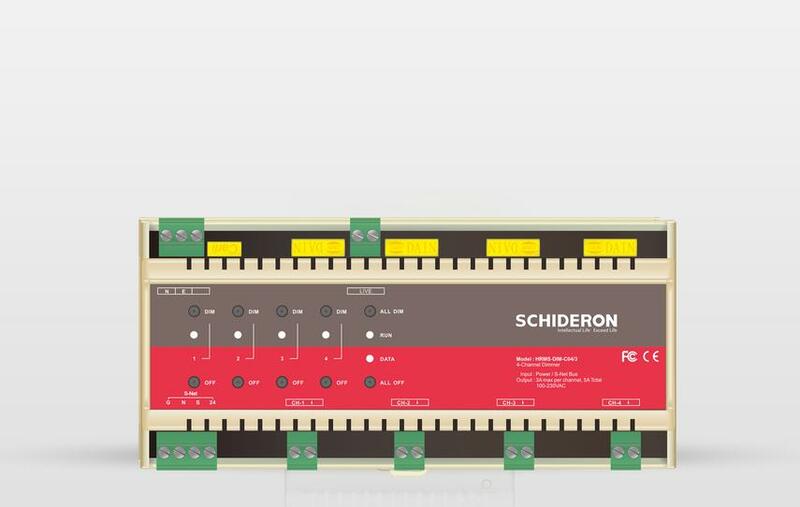 The maximum load current of a single channel is 3A, and the maximum current capacity of all circuits of the module is 5A. 4-way 3A thyristor dimming module (HRMS-DIM-C04/3) is used for front-phase low-voltage electronic (ELV), incandescent (INC), neon/cold cathode (Neon/CC), electromagnetic low voltage Lighting fixtures such as lamps (MLVs) perform leading-edge phase dimming control. The maximum load current of a single channel is 3A, and the maximum current of all circuits of the device is 5A. The independent lighting control, pre-editing scene control and scene timing control can be performed through the intelligent lighting management system (LMS) visualization. The module data can be uploaded to the intelligent lighting management system (LMS) for module status management and data statistical analysis, and the entire data transmission and equipment Control meets the latest industry standards.